How Do You Know If You’re Too Fat To Fly? I fully support airline policies that state if you’re wider than the seat you purchased, you must purchase a second seat so that you’re not encroaching on anyone’s space and each customer can have the same high-quality flying experience. There’s nothing wrong with this policy. The problem is customers aren’t informed enough at the point of purchase to know whether they need a second seat. Southwest Airlines is my go-to domestic carrier. They have great prices and generally have a lot of flights to places I want to go. On a recent trip, I flew Southwest and every flight coming and going was delayed. (Grrr.) This gave me a chance to do some premier people watching. It appeared that many people in the airport were on the cusp of being what Southwest calls a “customer of size.” It made me wonder how would a customer know if they qualify as a customer of size. I had to do some digging, but I found Southwest’s policy on customers of size. Their policy states that each customer must fit into the 17-inch seat with both armrests down or they must purchase a second seat. If their flight is not full, they may receive a refund for their second seat after their flight. I had to search Southwest’s website to find this information. Given that over 35% of U.S. adults are obese, it makes more sense to put a notice on the reservation page that states that customers who are more than 17 inches wide when seated should purchase a second seat or they will risk being asked to purchase a second seat at the airport. That way the customer is fully informed of the policy when making the purchase and they know the risk they’re taking when if they’re a customer of size and don’t purchase an extra seat. Apparently Southwest is being sued because they’re not informing customers of its policy or enforcing it uniformly. Kenlie Tiggeman said the reservation page doesn’t inform customers about the customer of size policy and that sometimes she’s forced to buy an extra seat and sometimes she’s not. I agree that customers need to know upfront that they need to purchase an extra seat if they are more than 17 inches wide, but there will always be people who are over the limit who don’t purchase a seat who will be allowed to board. Every customer shouldn’t be forced to prove they’re 17 inches wide or less before boarding a Southwest flight. To enforce the policy more uniformly, I think every airline with a policy regarding large passengers should have an airline seat in the terminal where customers can test themselves and airline personnel can check to make sure a passenger will fit in one seat. This provides a fair and objective test for everyone involved. I feel bad for the customer and the airline representative when there has to be a conversation about a passenger’s size and whether they need a second seat. It’s a situation that must be handled delicately. However, I won’t feel as bad for customers who knew exactly what the policy was before purchasing a ticket and risked being told they had to purchase an extra one at the airport or not fly. I was looking forward to reading your article since you posted it on FB. Not everyone is sensitive to the plight of the obese because not all are in the position to fully comprehend the challenges faced by that ever-increasing section of society. I hope my post did the topic justice. You don’t have a right to be fat. I disagree. I think people have the right to decide what you put in their bodies; however, I believe people need to accept the natural consequences of their actions. It makes me very sad when I see overweight children, because they’re starting life on the wrong foot. I think parents have obligations to raise healthy children and overfeeding is a sign of bad parenting. There are those like myself that have no control over it, I have a disease called Hoshimotos I have had it for almost 30 years and was only diagnosed with it 2 years ago. It is a Thyroid Auto Immune Disease, it affects over 1million women a year and only in the last few years has it started coming to light, because most people think and Dr. to it can be treated like any other Thyroid problem. Its really sad when I read the above comments, I have a very strict diet, no soy, no gluten. Its very wrong to look at the outside of a person and judge with out knowing. As for the whole airplane seating issue Sueing them is moot because at the time of purchase you sign a contract and burried in that purchase agreement is the 17 inch rule. Did you read of course not because it is written in such a way as that you are cross eyed before you make it to the 3rd line of the terms and conditions, you just want to go see your friends, family or get out of town for a breather. We all do it at some point, the answer is not in pointing a finger or publicly making someone sit in a seat before getting on a plane to see if they fit in the chair, thats no better than when Hitler was culling out everyone who wasn’t blond and we all know he was wrong for that. I think that the solution is business class seating if you can’t fit in coach then you’ll have to upgrade, less expensive than buying 2 tickets and hoping you will get your refund back. Thanks for sharing your thoughts Maggie. Having a airline seat available is an imperfect solution, but it was the only objective test I could think of. One of the complaints I hear is that airlines enforce their policies for customers of size inconsistently so passengers don’t know if they have to buy two seats. 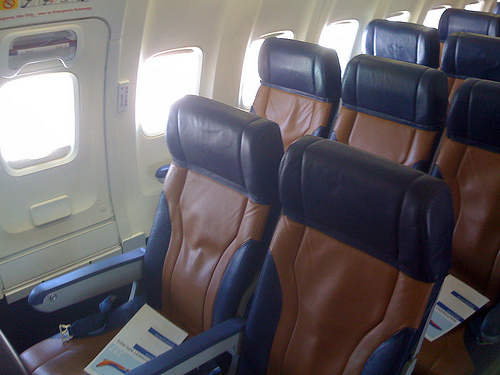 Having a sample seat would give passengers a chance to prove they fit in one seat if they disagree when the airline’s insistent that they buy a second seat. Your suggestion of buying a seat in business class would solve the problem as long as the plane has a business class. There are some flights where two coach seats is cheaper than one business class seat, so it’s worth doing the math in advance. I agree the policy should be posted prominently on the reservations page. It also should be enforced fairly. Every person who can’t fit in a 17 inch seat should buy a second seat. Period. The issue of a refund if the flight isn’t full can be addressed later. Another problem, though, is many people of size are in severe denial and think they can fit in a 17 inch seat, so won’t buy another ticket and voila- are denied boarding when they get to the airport if there are no more seats available or they can’t afford a second seat. Personally, I don’t want to sit next to one of these people and have them crowding my already limited space that I paid for when they try to shoehorn into a too-small seat. That might sound mean, but I can’t be the only person who feels that way. I agree that there will always be problems with people who are in denial of their size and people whose size fluctuates over and under the 17-inch limit who may believe they are under 17-inch wide when they’re bigger than that. An airline can’t force someone to accept the truth about their size, but they can consistently require people who are over the limit or close to it to sit in a sample chair to make sure they’re not going to encroach on another passenger’s space. If airlines are more consistent with enforcing their policy, passengers may be more willing to measure themselves and buy a second seat in advance if necessary. Nice article, Ruth. As a frequent flyer, this issue really gets my hackles up. More than anything, this is a potential safety issue. Imagine you’re packed in by the window seat with a couple boarderline 2-seaters next to you. Do you think that extra meat is going to be able to hustle ahead of you to the nearest exit in case of emergency? FAA rules leave the pilot responsible for weight and balance issues. These rules are almost always enforced on smaller planes. I think airlines should have a strict weight policy, weigh all passengers, and dub some too-fat-to-fly. Thanks for sharing your thoughts Andy! I’ve seen a few episodes of TLC’s “On The Fly” which is about Southwest Airlines. I think they’ve shown at least one incident where the plane had to leave with empty seats, even though there were people on the stand-by list, because the plane would be overweight if they filled every seat. It appears the pilots do what they can to get everyone on board safely, but it’s not always possible. Yeah, we live in the desert. A plane taking off at 118 degree temperature on a sunny day is a lot different, and can support less weight, than a plane taking off on a 75 degree rainy day. That makes sense – hurray for science! I like it when my plane doesn’t crash. The only issue I take with this is that a lot of people are over the 17″ seat restrictions. Therefore, the airline will profit off of a lot of people. Further, what if airlines decided on a 14″ seat and you didnt fit it. Would you like to pay the extra cost?… doubtful! 17″ is not large enough. I can see at 20″ then they can charge but 17″ inches doubled is essentially a women’s US size 15?! Thanks for sharing your perspective. You are right that due to the obesity problem, a lot more people are wider than 17″. The airline is probably using the same seats they’ve always used so this issue of having to buy two seats has become more prevalent. These people unfortunately have the same problem with seats at theaters and amusement parks. In most cases the cost to change out the seats is not cost effective. In some ways this seems unfair to make people buy two seats, especially for people who have genetic disorders and have little control over their size. But on the other hand, if you take up more than one seat, you shouldn’t encroach on someone else’s space. On an airplane, you have to pay for the amount of space you occupy.